Spring is here and it's time we start thinking about outdoor activities. Weddings, social gatherings with friends on the patio on a Saturday night are some great ways to enjoy the warmer spring weather. Adding a simple touch of lighting to any party adds a dramatic effect that will make your next event look like you've went out of your way. Simple focused colored or white lights on a tree, overhead or wall will give a grand appearance as shown above. Generally you can purchase these lights at any of your local home improvement stores and they're portable so you can use them inside or out. Picture #1. Overhead patio lighting adds ambiance. Picture #2. Simple rope lighting under the rail of your porch or deck. Picture #3. 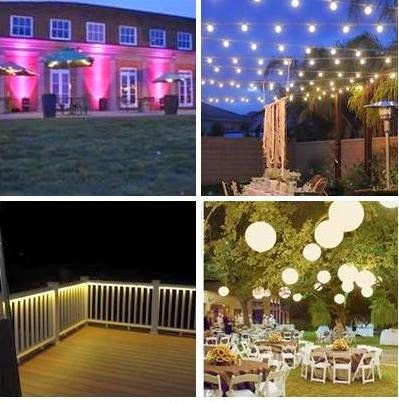 Colored up lighting in a back yard home are great for larger events. Picture #4. Simple chinese lantern lights hanging from the trees.